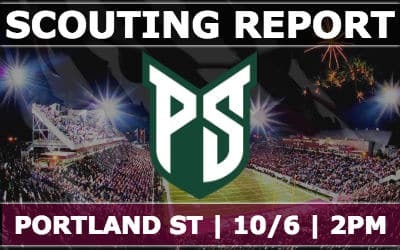 It’s time for your weekly scouting report brought to you by BWahlberg on the eGriz forums! It’s homecoming for Montana and the Griz are hosting Portland State. While on paper this game suggests a mis-match in favor of Montana but this game could prove to be tricky considering what the Griz are coming off of. Keep in mind that the Grizzly defense is coming off a game where they were on the field for almost 39:00 of game-clock and faced off against 95 plays. While they allowed just 28 points over that stretch they did give up 416 on the ground. Now PSU and their spread/run offense comes to town and could give the Griz a challenge if the defense doesn’t have its legs back just yet. 19-72 loss @ Nevada; Nevada ran for 240 and passed for 420 in this monumental beat down. PSU did put the ball in the air quite a bit, but just went 14-34 on passing, with 241 yards. 14-62 loss @ Oregon; Oregon put up a little over 550 yards of offense pretty evenly spread out. PSU went back to their ground game more but had just 66 yards on 40 attempts. 63-13 win vs College of Idaho; CoI is an NAIA school and in the Frontier Conference apparently. PSU scored 49 of their total points in the first half and went on cruise control from there, but did add a few 4th quarter scores. PSU ran for 350 and passed for 307. 23-42 loss vs Bozeman State; PSU kept it close through the first half but 17 Bobcat 3rd quarter points rapidly put the game out of reach. The cats kept things on the ground quite a bit, 323 rushing, while PSU had about 200 rushing and 220 passing. The cats really slowed the game down and limited PSU to just 10 possessions and the cats scored on 7 consecutive possessions, adding points while PSU couldn’t keep up. 7-20 loss @ Idaho: This game appears to have been a snoozer, PSU had 260 yards of total offense, Idaho 290 yards of total offense. The teams were a combined 8-28 on 3rd down. PSU opened with a good drive that died with a turnover on downs, from there just 1 more first down in the whole first half. That gives Montana 8 more and PSU 2 more with 1 push. The total is Montana 13, PSU 3, Push 1. #6 Davis Alexander; QB – the 5’11 Sophomore QB started the last 3 games of PSU’s prior season and carried it forward as their starter this year. He leads the team in rushing as well, with about 180 on the ground and has a team-best 3 rushing TDs. As the passer he’s averaging about 150 per game, has 6 TDs to 2 INTs, completing 50% of his passes. #89 Charlie Taumoupeau, TE – I’d venture he’s the leading TE in the conference. 420 receiving yards, 5 receiving TDs. Dude is averaging 28 yards per catch. He’ll be a matchup challenge the Griz have not yet faced yet. #33 Darian Green, RB – A Ball State transfer I believe he’s technically rotating in but has slightly better numbers than the starting RB, with 136 yards and 1 TD on the ground with 14 more yards receiving this season. #21 Carlos Martin, RB – Martin has started the last 2 games, he’s got 110 yards and 1 TD on the ground and has about 25 receiving yards too. #46 Kasun Jackett, LB – The 6-2, 225 pound senior is leading the team in tackles, he’s got 36 so far this season and 1 TFL. #1 Romeo Gunt, S – A 5-10 safety that’s a JuCo transfer he’s got 24 tackles, 3 TFLs, as well as 1 INT and 1 forced fumble this season. 1. Continue the CPSLO success on offense, make each possession count. PSU is another team that slows the game down but so far has not really shown the ability to keep up with their opponents when they keep on scoring. PSU so far reads like a team that can put up yards in many ways but hasn’t been great about turning those into points. 2. Don’t let Taumoupeau get loose. This guy appears to be their main difference maker in the passing game. Not allowing him to go off against the defense takes away their best receiving threat. 3. Keep the offense balanced. PSU doesn’t show a strong weakness at any given point but also doesn’t show they’re great at anything either. This will be a game where the Grizzly offense should be able to move the ball both on the ground and through the air. 4. Control the trenches. The O-line had a pretty good game last week, let’s keep building on that. Keeping Sneed from getting pressured too early has really helped this offense be more diverse too. If the OL can keep adding to prior-week successes this offense will only get better. Defensively disrupting PSU at the line of scrimmage will throw their offense off and help the Grizzly LB’s take advantage of open lanes. 5. Flip the field on ST. PSU’s special teams stats are generally not great, while Montana’s is staying strong. If Flowers and JLM can set up some shorter fields for the offense that’ll help big time. 6. Defensively force a few quick stops. Last week Poly was able to bend the defense in the 2nd half by keeping them on the field all day and turning most all possessions into points. PSU will want to do the same, if the defense can force some quick stops that’ll keep them from getting too worn down as the game goes on. 7. Avoid the let-down. Two weeks of big momentum-gaining wins, can’t take this game for granted and get caught sleeping. 8. Be prepared for what mother nature may throw at us. It’ll be a cool day and it’s projected to rain as the afternoon goes on. This will lead to slippery conditions and could set up some scenarios where there’s a few more fumble opportunities to gain or lose. It’s supposed to be cool and rainy, the Griz are coming off a grueling road win, and many times fans on here suggest the crowd that attends homecoming isn’t as energetic as others. This game I think will be kept a little closer than many may think. PSU likes to slow games down and if the Griz sputter a bit, points could come at a premium. I think that as long as the OL keeps on it’s current path the Griz will win this, but I think it’s not going to really be a solid win until later and wouldn’t be surprised if it’s a 1 or 2 score game at the half. I’ll go with a Griz win 31-10.